Maine's Susan Collins expresses hope Trump offer will lead to compromise; Pingree says bipartisan reform possible once president reopens government. Hoping to put pressure on Democrats, the White House billed the announcement as a major step forward. But Trump did not budge on his $5.7 billion demand for the wall and, in essence, offered to temporarily roll back some of his own hawkish immigration actions – actions that have been blocked by federal courts. 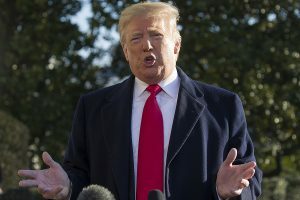 Seeking to cast the plan as a bipartisan way forward, Trump said Saturday he had support from “rank-and-file” Democrats, as top Democrats made clear they had not been consulted. He also said Senate Majority Leader Mitch McConnell would bring the legislation to a vote this week, although Democrats appeared likely to block it. McConnell had previously said that no vote should be held in the Senate until Trump and Democrats agreed on a bill. U.S. Sen. Susan Collins, R-Maine, said in a statement Saturday night that she is hopeful Trump’s announcement will lead to a constructive debate that will end the impasse. U.S. Rep. Chellie Pingree, D-1st District, criticized Trump’s proposal. Administration officials said the protections would apply only to those currently in the Obama-era program shielding them from deportation, and the temporary protected status would apply to those who currently have it and have been in the U.S. since 2011. That means people from El Salvador, Guatemala, Honduras and Haiti – countries that saw the status revoked since Trump took office – would get a reprieve.